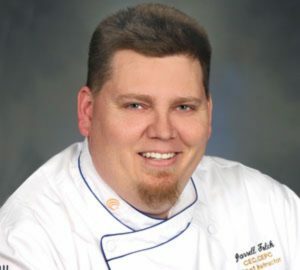 Chef Folck began cooking at the age 15 and began culinary school in 1994. At the age of 21, he graduated from the California Culinary Academy in San Francisco with an AOS degree in Culinary Arts. He then moved around San Francisco cooking in dining establishments, some of them an apprenticeship at the “Carnelian Room”, the opening of Kokkari, the Savoy, and working the Catering Company circuit. In 1999, he left San Francisco and went to work as the Executive Sous Chef at Coto de Caza Golf Club in Mission Viejo, CA until he moved into the position of Executive Chef. In 2002 he found himself at the Southern California School of Culinary Arts in Pasadena where he taught pastry, cuisine, theory, and sanitation. He was also Executive Chef for cancer & MS fundraising banquets and many others. While teaching, he was recognized as “Chef Instructor of the Year” for three years in a row. He was the Personal Pastry Chef for the Resnick Family, he was executive chef for many events and parties, held at their residence in Beverly hills showcasing the products from the companies they own like “Pom wonderful”, “Sunkist citrus”, “ “Wonderful” and “everybody’s nuts pistachios & Almonds” just to name a few. While he worked for the Resnick Family he cooked for Martha Stewart, Presidents, Senate leaders, Governors, as well as many Hollywood celebrities and Sports stars like Magic Johnson, Celine Dionne, and Pablo Picasso Jr. In 2006, he won a Gold Award from the Southern California Food Writers Association for his work. He was recognized as one the top Chefs and Pastry Chefs in the Pasadena area. He won first place in the “Off The Wall Cake Competition” for his Roger Rabbit Cake. In 2009 he was proclaimed “Best Chocolatier in Pasadena” by the mayor at the First Annual Chocolate Chip Ball. In 2005, at the age of 29, he became a Certified Executive Chef recognized by the American Culinary Federation, which he has been a member for over 15 years. He also earned his Certified Executive Pastry Chef. He is also an Approved Certification Evaluator, ACE. He has been teaching baking and pastry for three years at Oregon Coast Culinary Institute in Coos Bay, Oregon. Most recently he was recognized as one of the “Top Chocolatiers & Pastry Chefs in the USA” as he was asked to participate in the Las Vegas Chocolate Festival, where his Chocolate Saltimbocca and Venetian Mask were among the highlights of the fundraiser. He has a passion for teaching, sharing, and spending his life trying to learn as much about cooking, baking, and everything else that goes along with being a chef. He will continue to do so for the rest of his life with pleasure.